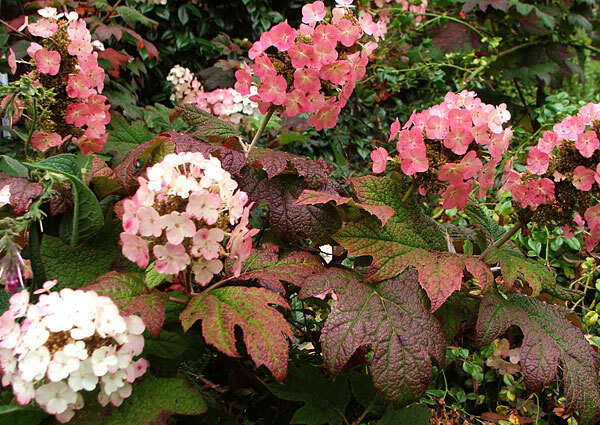 Hydrangea quercifolia is a super-stylish shrub I grow. 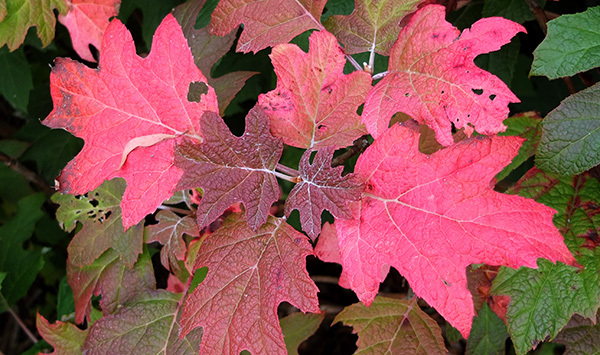 It's an oak-leaved hydrangea, with beautifully shaped summer flowers and beautifully coloured oak-like autumn leaves. My shrub has to struggle through a cherry rambling fence rose to be seen. And, like my other hydrangeas, it responds well to discrete (and indiscrete) summer watering sessions. In my early gardening days I was hugely influenced by English garden writers, and I remember this shrub being given a high style score. 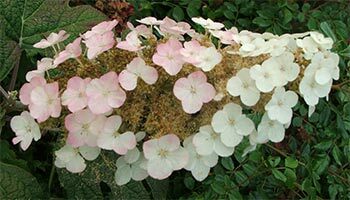 Its flower-heads are elongated and creamy white in colour - the pink tinges in this picture may be due to rain. My oak-leaved hydrangea would get noticed more if it had more room to breathe and stretch out. So I need to trim back the cherry rambler after flowering. And to discipline the neighbouring patch of Comfrey, which is sprawling in every direction by mid-summer. I'll try and remember - I promise! In 2009 I enjoyed an early summer holiday in Washington DC. After seeing how expansively these shrubs grow in private and public gardens there, I'm now green with envy. My shrubs are very lightweight in comparison!